Performance shot courtesy of Fiona Larkin. An absurd recording of overlapping voices penetrates the expansive gallery, its visceral undulations suggesting a liminal quality between the human and supernatural. This rather unsettling, song-like audio inconspicuously weaves into an ordinary spoken dialogue. BALTIC 39’s commission The sounds here are bouncing around us and Susan and Anne and that object allowed the Newcastle-born artist Nicola Singh to develop her interdisciplinary mode of thinking around the concepts of voice, movement and language in relation to encounter and location. Although now reaching the final stages of the exhibition, Singh transformed the Project Space over a two-month period as installations were progressively added to document her creative journey. A programme of collaborative projects, workshops and live events within the gallery channelled her exploration of the interplay between voice, sound and movement within a particular feminist discourse. Articulated through an eclectic synthesis of contemporary art practices, Singh’s work spanned from performance and visual art, to deploying text, audio and objects. At first sight, the exhibition appeared an enigmatic juxtaposition of disparate installations. Yet these served to showcase Singh’s organic process of experimentation through her language of the conceptual and the intuitive, rather than the narrative and concrete. The earliest addition to the space welcomed four distinct and purely abstract sketches scribbled in crayon across a bare wall. Conceived by seventeen local university students, these strikingly raw interpretations were the results of a ‘make a drawing of your voice’ workshop. Two speakers were positioned at either end of the Project Space and looped the ‘spoken-sung’ conversation: “they go into a little room and they bang a little drum.” The layered and penetrative exclamations were bizarrely evocative and replicated a distinct feeling of conversation. This addition of the sonic medium was the result of a collaborative project with the artist Harriet Plewis to explore the possibilities of the female singing voice and nature of dialogue. In another piece, three isolated silk tapestries displayed large-scale images of various female performers in action, which were photographed by Fiona Larkin. The improvised choreography ‘slanting, semi-cascade’ (2017) with Hannah Buckley allowed a performative exploration of positions, forms and gestures in relation to the female body. In this project, Singh’s propensity to transcend boundaries of familiarity prompted her audience to construct their own narrative and reconsider their associations surrounding such imagery. Prominent silk print images of the female body were echoed with a masked snapshot of Singh and Helen Collard’s performative exploration. 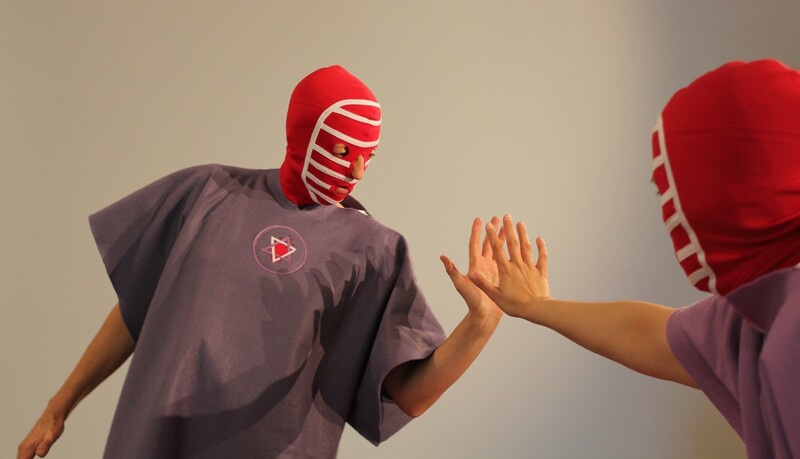 The figure of Kendo Nagasaki, a wrestler who famously hid his identity and voice, was the impetus for POWER GRAB (2017), a liberating theatrical dialogue, in which the exchange of vocal energy through a vocoder played with dynamics of intensity and power. Interestingly, what resonated throughout each installation piece was the importance of their devising as a fluid process, over traditional aims to generate a self-conscious final aesthetic. Whilst the concept of a ‘workshopped’ exhibition is perhaps unusual, Singh’s broad repertoire of artistic expression allowed an intriguing dialogue between all mediums. the sounds here are bouncing around us and Susan and Anne and that object, Baltic 39, Newcastle-upon-Tyne, 16 March 2017 – 14 May 2017. Eleanor Benson is a writer based in Newcastle upon Tyne.